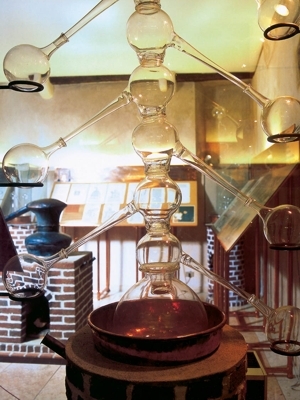 In the Vatican Consilia codex of 1276, Taddeo Alderotti of Florence (1215-1302) described in detail the production of aqua-vitae obtained from wine with double distillation. Moreover, Alderotti was the first to describe the coil immersed in cold water to condense the vapours. In fact, the system for cooling with water made its appearance between the 13th and 14th centuries. Instead of ending directly in the distillate collection pot, the spout of the capital was made to pass inside a barrel full of cold water. Therefore it is not surprising that the important Siena scholar and philologist Andrea Mattioli (1570 – 1577) described this innovation in his work. Vannoccio Biringuccio (1480-1539), an illustrious contemporary of Mattioli, described the first still that distilled and also rectified, by eliminating the parts full of impurities produced at the start and end of the distillation cycle. By conveying the vapours through long,winding, narrow ducts, this still blocked the impurities, allowing only the best part of the distillate to be retained. In the 17th century, the Neapolitan Giambattista Della Porta, who was the first to understand the principle of the distillation column, made a very special still for the purpose of obtaining aqua-vitae from a single distillation. He called this long and narrow apparatus the Seven-headed Hydra. This insight almost passed unnoticed. However, two centuries later it permanently changed the history of distillation.